A view down the beach in Camps Bay. Camps Bay is the "Malibu" of Cape Town. On the west side of Table Mountain the slopes are full of beautiful villas. Photo by Gregor Hofbauer. Cape Town is known as the Mother City of South Africa for being the oldest city in the country—but old certainly doesn’t mean outdated. Instead, Cape Town offers one of the most dynamic city travel experiences, rich in history, culture, and geographic diversity. Here you’ll find some of the most unique cuisine, a thriving arts scene, beautiful beaches for surfing and lounging alike, hiking, shopping, and many exciting neighborhoods to explore. 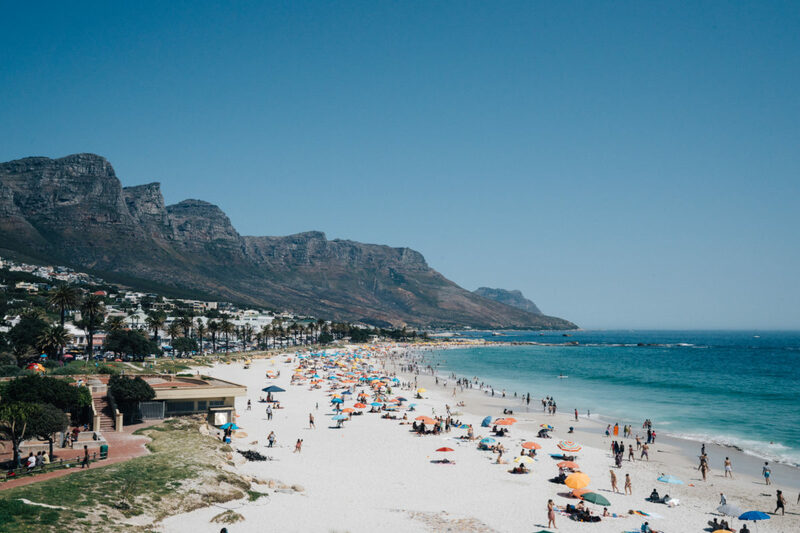 It’s no wonder Cape Town is one of our top destinations for 2019—below, we outline all the different ways to take advantage of the city’s authentic splendor. We cover the essentials: where to stay, what to do, where to eat, drink, shop, and more. A local filmmaker is closing the cultural divide in South Africa—and shares the Cape Town creative scene’s favorite hangs outs. Ranked by level of difficulty, you won’t want to miss this in-depth guide to Cape Town’s best hikes. These design-forward stores offer unique souvenirs, indie clothing designers, and locally handmade goods. Photographer Gregor Hofbauer shares the journey that helped him slow down and take in all of South Africa’s geographic wonders. We go in-depth on Cape Town’s art scene. Yann Rey quit is New York finance job and moved to Cape Town, where he’s been a force in the food scene ever since. The Sanbona Wildlife Reserve is known for its proximity to Cape Town and affordable prices. The city has made great strides in protecting its natural resources—boosting the tourism economy will only help.